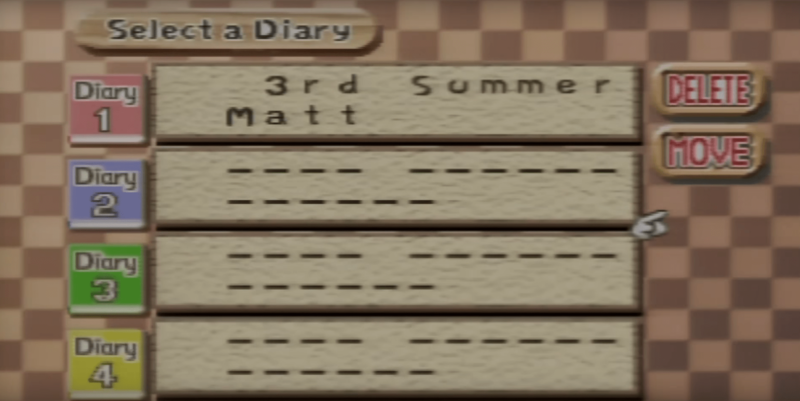 Today we’re going to uncover the requirements to get 100% completion on Harvest Moon 64’s hidden farm completion menu. We’ll first go over how to unlock the menu and then go over the requirements to get see that sweet perfect 100%! 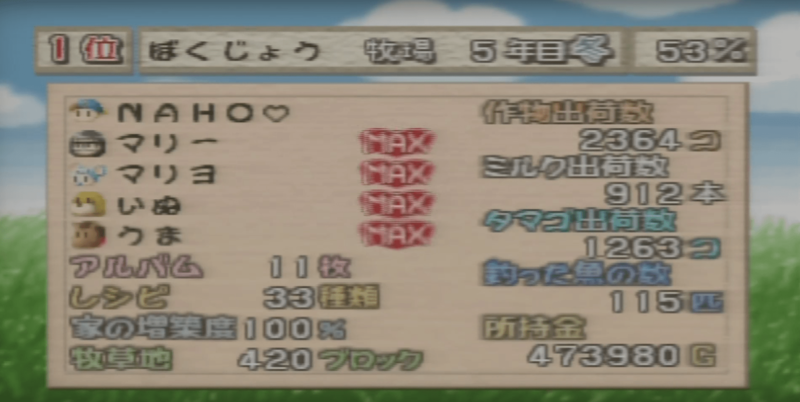 In the Japanese version of Harvest Moon 64 this menu always existed, no codes needed. However in the US release the menu was scrapped from the game! What????!!!!! Luckily KhalaHM on GameFAQs forum discovered it existed and created gameshark codes to unlock the hidden (and fully translated) menu. If you’re using an emulator however, you can use my ROM hack that enables the menu to be accessible from the get go. No game shark codes needed! Special thanks to Zoinkity from Assembler games for helpin me create the ROM hack! Then you will have to start the game, go to the file selection menu, hover your cursor over the “Delete” button and press the L Button. Press down on the control stick and you should now see your cursor hovering over a hidden menu item. Click the A button and the farm completion menu will present itself! Yea!! You now will no longer need the gameshark cheat you will just need to move your cursor to the invisible menu item below the “Move” menu item on the file selection page. That’s it! It took me ~100 hours to reach 100% completion, but I love Harvest Moon 64 so I had a blast doin it. 100% completion is actually 99% completion. Due to a float truncation error that occurs when the game tries to add everything up, the farm completion menu displays a completion percentage of 99% rather than 100%, but rest assured 99% definitely equates to 100% completion. The farm completion menu occasionally stops calculating… I don’t know why for sure. This occurred for me only when I was utilizing gameshark codes to test out completion percentages. So yet another reason not to use gameshark codes to achieve this feat. The farm completion menu will stop calculating if you have two farms with identical names. So don’t copy you file to other available slots or name another files farm the same as your current file. You’ll be sad and there’s no fixing it after you’ve done it. That’s it for this post! Be sure to check back in the future for more!